In recent years we’ve seen the growth of cool camping and glamping in a tent, an experience meant for those who have no intention of either roughing it or traveling light. However, although glamping may be the new and very modern way of deluxe camping in the case of tents it has sprung from very humble beginnings that are hundreds of years old. Camping is only one word but it means different things to different people. Some want to set off with just a sleeping mat and backpack to sleep under the stars, while others love to take the best gear and gadgets and stay in camper vans, caravans or under canvas. But however they want to experience it, there is no doubt that being outside in natures playground is something we all enjoy, as each time we do it the air smells sweeter, food tastes better and the birds sound louder. Whether it’s in a bell tent, shepherds hut, tipi or yurt, glamping always includes luxury accessories, beds, quality linen, carpets, gadgets and a view to die for. As a result this style of camping has become popular amongst those who are not hardened campers, but instead want to discover camping in a more deluxe, well-appointed and easy-going way. 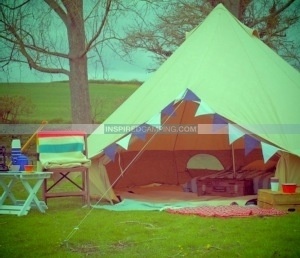 But where did the many and various styles of glamping come from and how did it all begin with tents? Bell and Sibley tents are incredibly popular amongst the glamping population but they were first used by the military in America and Europe, particularly during the Crimean War in 1855. They have a central pole with canvas outer and now can be fitted with a wood-burning stove to really make them a home from home. Some had a similar design to a tipi. Wooden Camping huts or Shepherd huts are often quite small and fixed on wheels. This was to allow shepherds the ability of moving it to where their flock was grazing, giving them a bed on wheels. Now they are insulated well and often have a power source so are great in all weathers. Roulettes, Gypsy Caravans and Romani Wagons were traditionally horse-drawn houses on wheels for Gypsy travellers. Roulettes originate from France and were often made and insulated with recycled and natural materials and elaborately painted. These were perfect vehicles for a nomadic lifestyle and were the first horse-powered caravans. Canvas lodges or Safari Tents were first pitched in Africa to give safari tour guests a safe place to live amongst nature. They are particularly suited to hot and humid conditions as all the sides can be lifted giving a cool breeze and shade. are circular wood framed tents with low rooflines that originate from Asia. They were able to withstand winds and have some kind of wood burning stove to make sure everyone stayed snug in the cold temperatures. These have been around since at least the 13th century. Pavilion Tents, Pergolas, Maharajah and Raj Tents come from India and tend to be elaborately hand-made and decorated to represent total affluence of its owner with flowing silk and cotton fabrics. Inhabitants of these tents were often powerful and noble. Tipis, Tepees and Wigwams were developed by American Indians to suit their nomadic lifestyle in the 1800’s. The chimney was included in the design to allow for a ventilated central seating and open fire area, making them warm, comfortable, sociable and easy to pack away. Tree Houses were first designed to keep people off the ground and away from predators. They come in many elaborate shapes and sizes, can be made from wood or canvas and today even businesses operate from them with hotels and restaurants being able to draw a large crowd to their unique position in the canopy. Are you, or have you already, thought about buying one of the above tents? Let us know in the comments section below as we’d love to hear about it.